Quinton Jackson earned a shot at the UFC light heavyweight belt currently held by Rashad Evans, but he will be unable to accept the proposed May 23 bout. It appears that Lyoto Machida will instead face Evans for the title in the main event of UFC 98 in Las Vegas. After losing the light heavyweight championship to Forrest Griffin last summer, Jackson returned with a quick knockout of nemesis Wanderlei Silva at UFC 92 in December, then walked away with a unanimous decision over Keith Jardine last weekend, which was enough to put him in the UFC 98 main event. The slot was vacated when Frank Mir, due to a recent knee injury, was unable to be properly prepared to face Brock Lesnar to unify the heavyweight championship as planned. 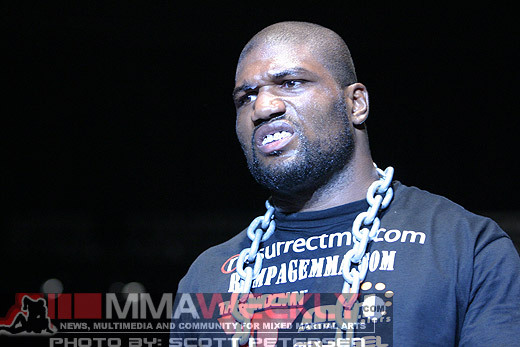 Evans had been scheduled to defend at UFC 100 in July, but agreed to push his fight up to UFC 98 when the Mir-Lesnar bout was lost. UFC president Dana White on Wednesday told Yahoo! Sports’ Kevin Iole that the UFC 96 post-fight pain in Jackson’s jaw turned out to be torn ligaments that will require surgery and five weeks of no contact. Jackson also hyperextended his left elbow in the Jardine fight. As White confirmed on Saturday night, if Jackson was unable to accept the bout, they already had Lyoto Machida waiting in the wings, already agreeing to take the fight. Although Machida’s camp was unavailable for comment at the time of publication, Evans’ manager, Jervis Cole, informed MMAWeekly.com that Evans has verbally agreed to face Machida at UFC 98. Bout agreements have not yet been signed, but should be shortly.